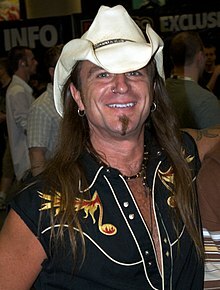 Scott McNeil is an Australian-born Canadian actor and voice actor. He currently resides in Vancouver, British Columbia, Canada. One of the most well-known Canadian voice actors of all time, McNeil has provided voices to many characters in animated shows, most notably The Wacky World of Tex Avery, ReBoot, Beast Wars: Transformers, Storm Hawks, Dragon Ball Z, Mobile Suit Gundam Wing, InuYasha, Ranma ½, Fullmetal Alchemist, X-Men: Evolution, League of Super Evil and Mega Man. He has done live action work as well. McNeil was born in Brisbane, Australia, but moved to Vancouver, British Columbia, Canada when he was 4 years old in 1966. He first appeared on stage at the age of three. He first learned that people were paid to do different voices after a trip to Disneyland at the age of 12. That was when he learned that Paul Frees, the person who provided the voice that greeted visitors entering the Haunted Mansion, was the same person who provided the voice of the Pillsbury Doughboy. Even though he knew about voice acting, McNeil pursued the theater. He studied at Studio 58. After leaving, he tried to find acting jobs and worked as an Elvis impersonator for a short time. It was in the late eighties when he found himself on his way into the world of voice acting. A casting director at the time told McNeil that he had wished that he'd met him a week before; he was casting for the G.I. Joe cartoon. McNeil states his first role was providing voices on The New Adventures of He-Man. His first anime role was for Project A-ko, where he provided the voices for three women. After appearing in a few films and two episodes of Highlander: The Series, he provided voices for Beast Wars, as Waspinator, Dinobot, Rattrap, and Silverbolt. He has described this as the work he is most proud of. On another fan favorite show, Dragon Ball Z, he was cast as the original voice of Piccolo and various other characters. He then provided the voice of Duo Maxwell on Mobile Suit Gundam Wing and Principal Kuno on Ranma ½. He eventually got the call stating he was cast as Wolverine on X-Men: Evolution. He continued to play the role of Logan/Wolverine for a total of four seasons from 2000-2003. McNeil was then cast in another fan favorite anime, InuYasha as Koga. He provided the voice of the Fullmetal Alchemist character Hohenheim of Light, Foghorn Leghorn on Baby Looney Tunes, Grumpy Bear on Care Bears: Adventures in Care-a-Lot, Amergan, Gregor and the lab director on Highlander: The Search for Vengeance, and Stork on Storm Hawks. He still appears in live action shows occasionally and was in Scooby-Doo 2: Monsters Unleashed and The Green Chain. As of October 2007, he estimates that he has provided voices to 8,500 characters. McNeil is appreciative of fans because he knows what it is like to see your favorite voice actor talk as the character they provide the voice for. He says that he is inspired by Paul Frees, Maurice LaMarche, and Mel Blanc. If he had a chance to meet the late Mel Blanc, McNeil has said that he would "fan boy all over him." Dr. Slump — Mr. Skop, Race Car Driver, Syoppaman, Mr. Salad, Akira Toriyama's Dad, Suppaman, Ultraman, Alien Kid, Alligator, Charmy Yamada, Jubei Norimaki. ^ a b "Animerica: Animerica Feature: Gundam Wing Voice Actors". Archived from the original on 10 February 2001. Retrieved 23 June 2010. ^ a b c d e "Voiceprint with Trevor Devall & Guests episode 8 — Scott McNeil". 25 October 2007. Retrieved 10 April 2009. Wikimedia Commons has media related to Scott McNeil.